With so many of our A team away it was great to see what we could manage without them. Rung to celebrate the birth of Hayley Anne Bubb. Rung in W&P peal festival. Last night’s Quiz (Saturday, 24th March) to raise funds for the Island and Channel Islands team entering the Youth’s Competition was a huge success with 14 teams of four playing. Total raised during the evening was a tremendous £312.50, which included a £100 donation from an anonymous source. Thank you to all who took part in making this such a big success and a very big thanks to all the guys and gals at the Eight Bells, Carisbrooke, for all their support and help on organising the event. Think Viv Nobbs is laying down in a darkened room at the moment trying to get over the evening! Sorry if the jokes, stories and puns were a bit corny but, hey, you all laughed and seemed to enjoy the evening, which was the intention. A few photos from when we went to Alderney the weekend to practice for the young ringers competition in Epsom! Definitely the best trip I’ve ever been on. Hold the front page: Viv Nobbs, Guild Master rang her first handbell qtr at Wells Ho, Alderney on Sat March 5th – trebles to bob minor. My First was yesterday – at Wells House, Alderney – first on Abel Simulator with Moving Ringers. Great stuff! 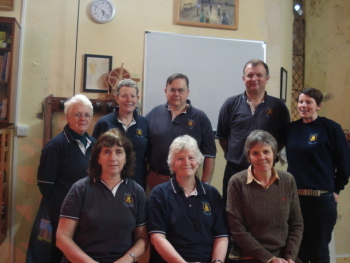 Firsts Fortnight began on 1st of March, and the Channel Islands ringers wasted no time – a Double First for Aileen Wilson (First Quarter of Surprise on Tower Bells, and First Handbell Qaurter Away From Tenors) and a First Treble Bob Quarter for Victoria McAllister. Congratulations Aaron Hallett (Alderney) First Quarter Peal and Happy Birthday! Rung for the 12th birthday of Aaron Hallett. First quarter, 6. The band, Donald is on the right. First Ever Local Band Rings a Peal on Alderney – 3 Firstpeal2015! It has always been a day of celebration on Alderney, and to mark the 70th anniversary with a peal has always my intention. It became even more pleasing to be able to ring the first ever local band peal, together with 3 first pealers and one first tower bell peal, during the year of the first pealers!! It was a well executed peal, a little slow with very few errors.